"WITH HEART IN HAND I GIVE YOU MY LOVE"
February is the month of HEARTS AND FLOWERS. . .Who am I to disagree? . .After the gray days of Winter, I'm more than ready to add them to the FARMHOUSE. . .They bring POPS of my favorite COLOR, too. . .RED!! John started the month out right with the ROSES. 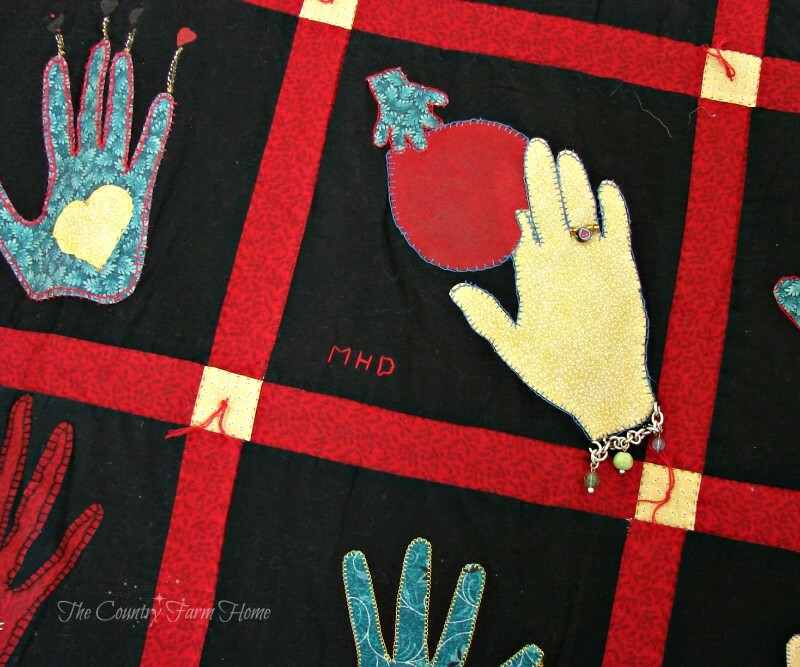 . .
and I decided to add the hearts with a JUNKIN' FIND that I simply. . .
Well. . .I simply. . .OK, I'll say it. . .LOVE. . . 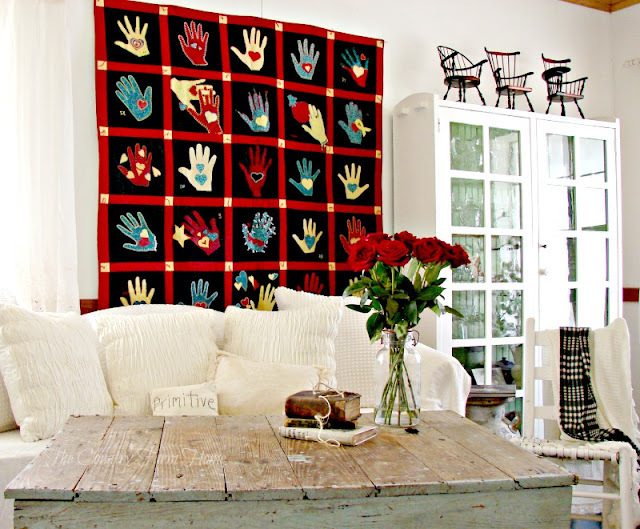 It's a striking appliqued piece of FOLK ART that happens to be a QUILT. . .
and I almost missed it!!! You know those Antique Mall booths that are so piled up that often you just pass on by them? That's where this piece was discovered. . . I did pause for a few seconds. . .peeping in before deciding it wasn't worth the effort. . .but I hadn't gone far beyond the next booth when something registered in my mind. . .
Sticking out from an overly full clothes rack was just a SMALL corner of a QUILT with a black backgound. . .Since I have touches of black all around the house, I was curious. . .As I untangled it from jumbled LINENS and 30s quilts, I was delighted at what I saw. . . Rarely do I purchase anything now without thinking about it for a time. . . Does it fit into my Plain and Simple Style? Where will I put it? Is it a good price? No thinking with this FIND. . .I grabbed it up and held it close. . .knowing it was coming HOME with me. . .As I walked around the Mall, others stopped me and asked where I had found such a wonderful quilt? . .I'd smile and hug it closer. . . 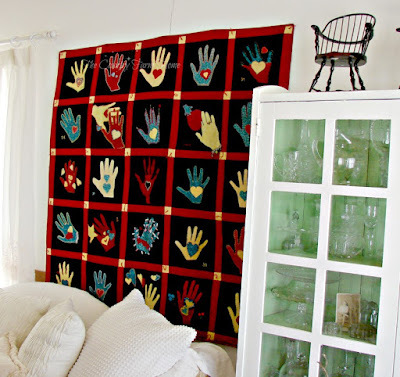 Some say the Heart In Hand is Shaker. . .Others attribute it to the Amish. . .and still Others claim an African-American influence. . .Doesn't matter who is right. . .it fits perfectly in the FARMHOUSE. . .and fills the stark wall of white behind one of the sofas with LOVE. The quality of the workmanship is so nice. . .The HANDS appear to be tracings of actual individuals. . .There are INITIALS on some of the squares. . .I'm certain more than one person made and EMBELLISHED the squares. . .I can almost imagine the different personalities by the story each block tells. . .so CHARMING. . . 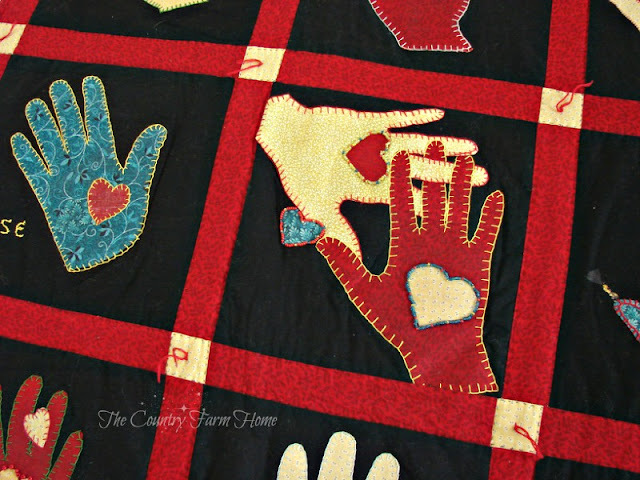 Although I have no idea who made this FOLK ART QUILT, I'd like to think it was FAMILY AND FRIENDS who were truly in someone's CIRCLE OF LOVE. . .Sharing their HEARTS IN HANDS. . . 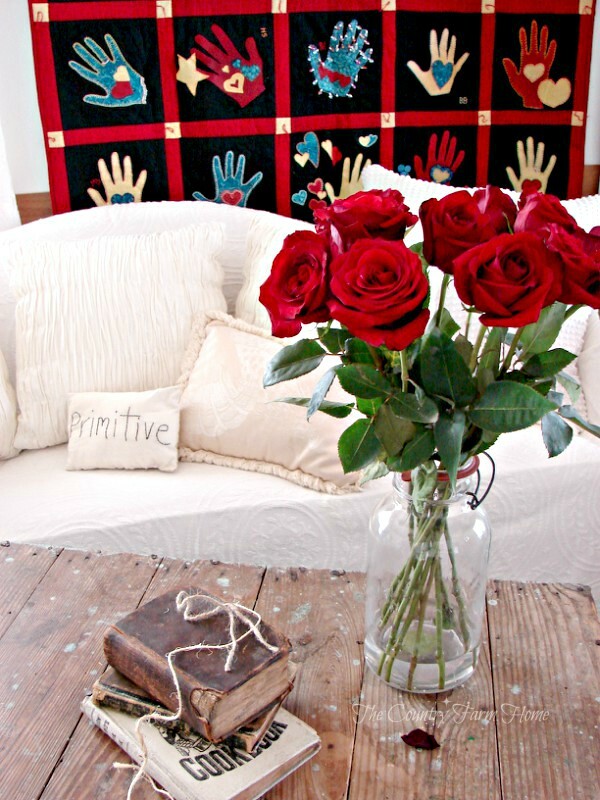 It was only right that I purchased such a special Quilt for our FARMHOUSE CIRCLE OF LOVE. . .
And that. . .I SHARE IT WITH YOU. 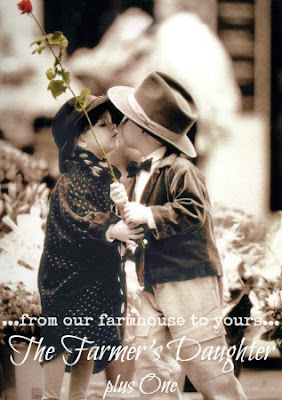 . .
"WITH HEARTS IN HAND WE SEND OUR LOVE. . ."
That is a beautiful quilt with so much colour added to your living space. What a great find! I also love your coffee table. The old wood and colour are really nice with your whites. Good job of your hubby buying red roses too. ;) Have a lovely week. That quilt is stunning and looks perfect behind your couch. Wonderful find! What an absolute treasure. So glad something made you go back to look, un -jumble mess to find it, was meant for you to have. I believe that or else what made you go back to look? Karma. Last year we were at Goodwill, usually don't go thru linens but did that day,, found beautiful double bed size hand sewn quilt for $8.50. I grabbed that for my basket, didn't care it was too small for our bed, but have it on bed anyway. It was clean and so pretty. All I ever put on our bed is quilts, even in Summer, have special one I use. 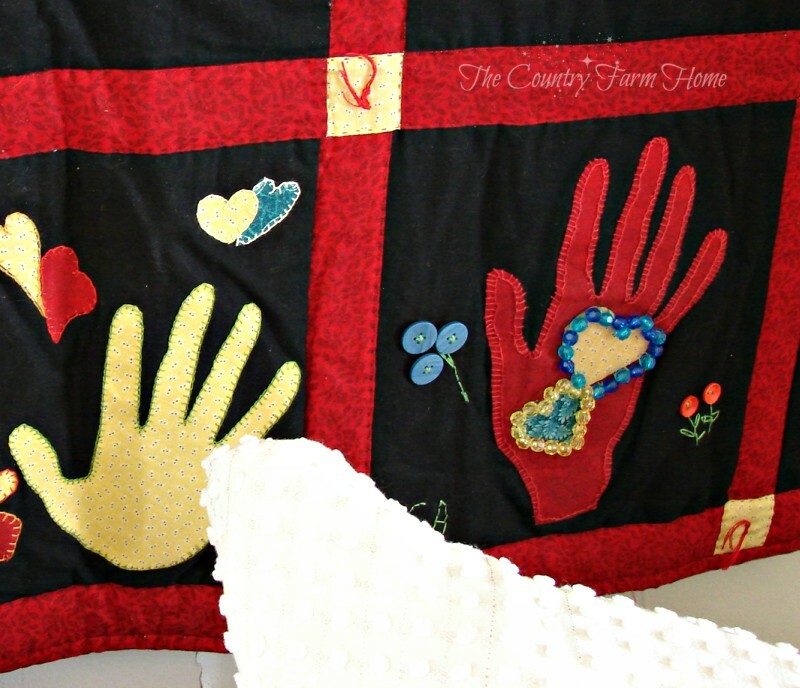 Enjoy your incredible quilt, we find things for a reason, God knows we'll take good care of it and cherish it. We've been very lucky to have quilts from both our Mom's. That is a stunning piece! Absolutely love it! Hi, I am new to the blog world and I am also your newest follower. 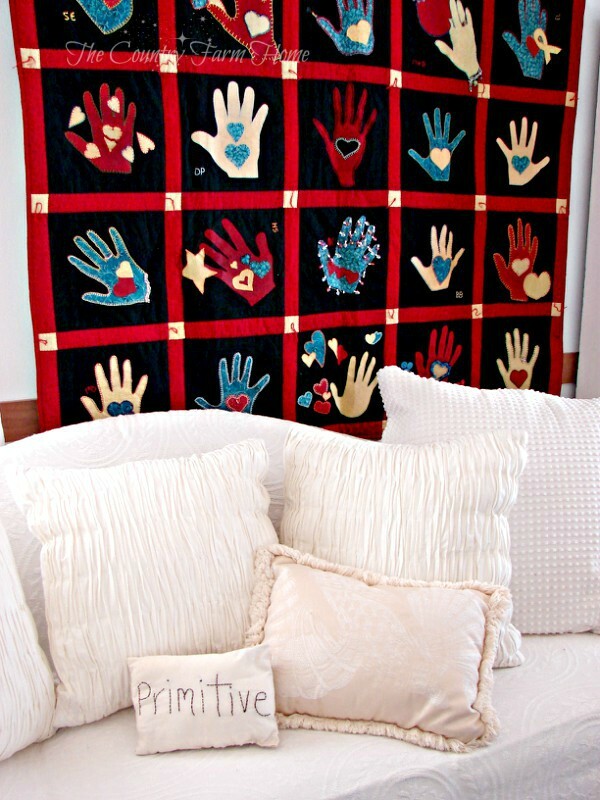 :) This is a beautiful quilt, I just love that feeling of finding something so unique, one of a kind, and for a good deal and you know it was meant for your home! If you have a moment I would love for you to check out my blog! 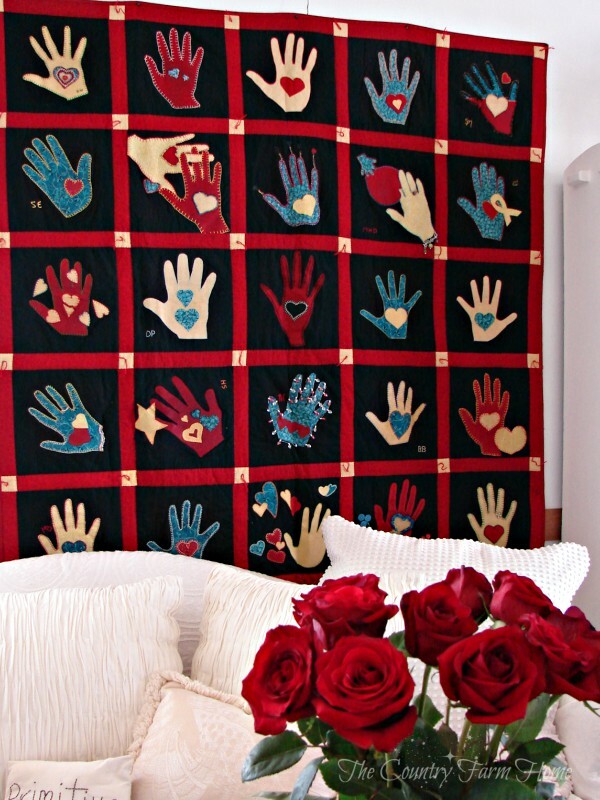 My heart jumped in my chest when I seen that picture of the heart in hand quilt. I was just saying to myself yesterday I love that pattern. I have a pin heart in hand. What an amazing quilt! I'm glad it found you. What a Journey Through FARMHOUSE STYLE We've Had!